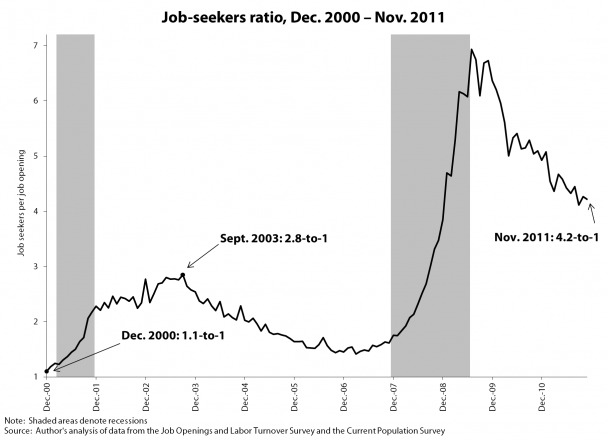 While the job-seekers ratio has slowly been improving since it peaked at 6.9-to-1 in the summer of 2009, today’s data release marks two years and 11 months—152 weeks—that the ratio has been above 4-to-1. A job-seekers ratio of more than 4-to-1 means that there are no jobs for more than three out of four unemployed workers, no matter what job seekers do. The upshot: although things are certainly getting better, the economy simply hasn’t picked up enough steam to accomodate the number of people still searching for work. So the next time someone claims that laziness, drug abuse, or a lack of education are at the root of the economy’s ills, show them this chart!